George H.W. Bush - Be Bold, Be Bald! President George H.W. 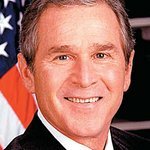 Bush has been named the first Honorary Ambassador to the grass roots movement, Be Bold, Be Bald! 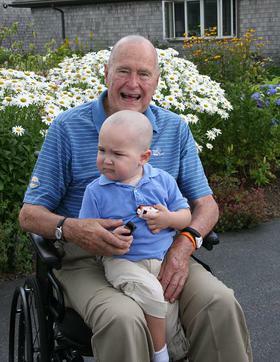 George H. W. Bush has been named the first Honorary Ambassador to the Be Bold, Be Bald! movement taking place across the nation on October 18th, 2013 to help support cancer awareness. The cancer fundraising organization encourages people from all over the country to “go bald,” sporting a bald cap in a show of solidarity for those who don’t have a choice in losing their hair. Similar to a bike ride or road race, participants will encourage friends and family to sponsor them to go bald. Be Bold, Be Bald! will share President Bush’s touching show of solidarity this past summer when he shaved his head for the 2-year-old son of long time secret service agent. If President Bush can shave his head at 89-years of age, then others across the country can sport a bald cap for one day of support. Be Bold, Be Bald! does recognize shaving your head as an alternative to wearing the bald cap. In celebration of five successful years of cancer fundraising, Be Bold, Be Bald! is offering participants from across the nation a chance to become even more involved through their newly launched Ambassador Program. Ambassadors for the 5th annual event, taking place on October 18th will encourage fundraising groups and beneficiaries in their area to spread the word and “go bald,” sporting a bald cap. In addition to the Ambassador Program, registration for group or individual participation is available at the online registration site. Be Bold, Be Bald! was founded in honor of the late Mike Connell, co-founder and former Creative Principal of Boston-based advertising agency Small Army, in 2009 by friend and business partner, Jeff Freedman. Mike lost his 3rd battle with cancer after a heroic 2-year fight in 2007, leaving behind a wife and three children. To date, the event has raised more than $600,000 for more than 40 organizations, with approximately 10,000 participants across the United States. Be Bold, Be Bald! is managed by Small Army for a Cause, a 501c3 organization committed to helping raise awareness and funds for medical-related causes. For more information please visit the Be Bold, Be Bald! website and watch their compelling video here.